Join us for a special workshop on how to plan and plant for a soup garden that will yield the ingredients for a late summer gazpacho and a hearty fall squash soup. 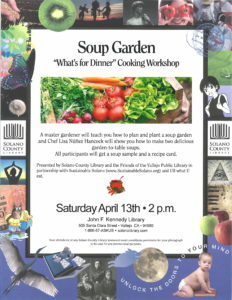 We will hear tips for planting from a guest master gardener and Chef Lisa Núñez-Hancock will walk us through the recipes for making delicious garden-to-table soups. All participants will get a soup sample and a recipe card. This program is presented through the Solano County Library and the Friends of the Vallejo Public Library in partnership with Sustainable Solano and UR What U Eat.